If you look roughly into the Nepali cuisine, you may feel that Nepal lacks varieties other than the so-called staple “Dal bhat”. But, when you look deeper into the Nepali kitchen you will discover a new dish in every home for every occasion. 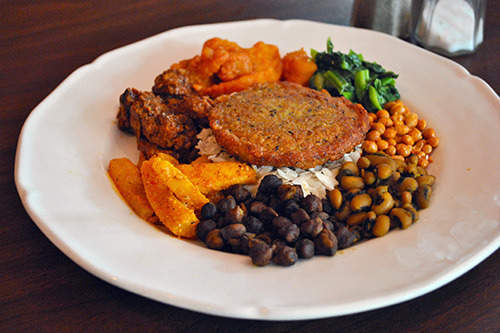 The multi-ethnic and multicultural Nepal has its own variety of dishes to offer. Every community in Nepal holds its own food culture that is yet to be explored. The Newar community itself has more than 200 dishes in its cuisine. 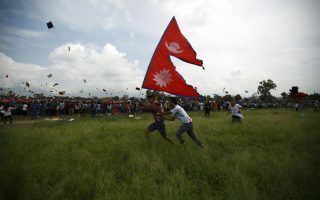 The mountain region of Nepal has cuisines that are much influenced by the Tibet while the Terai has its own wide variety of the food due to rich agricultural production. 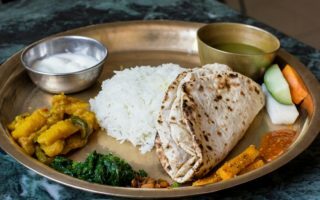 Many of these unique Nepali dishes are left unnoticed as they are not commercially produced and served in the restaurants. 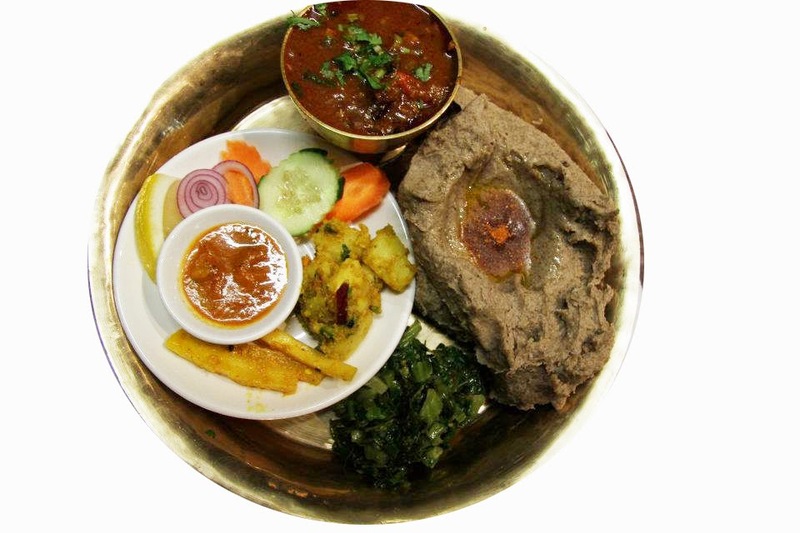 In our list, we have tried to include the dishes which have their own unique Nepali flavor and are comparatively not accessible to the one new to Nepal. Yomari is one of the most unique dishes offered by the Newar community of Nepal. This steamed dish is specially prepared in a Newar family during the winter and said to kill cold. 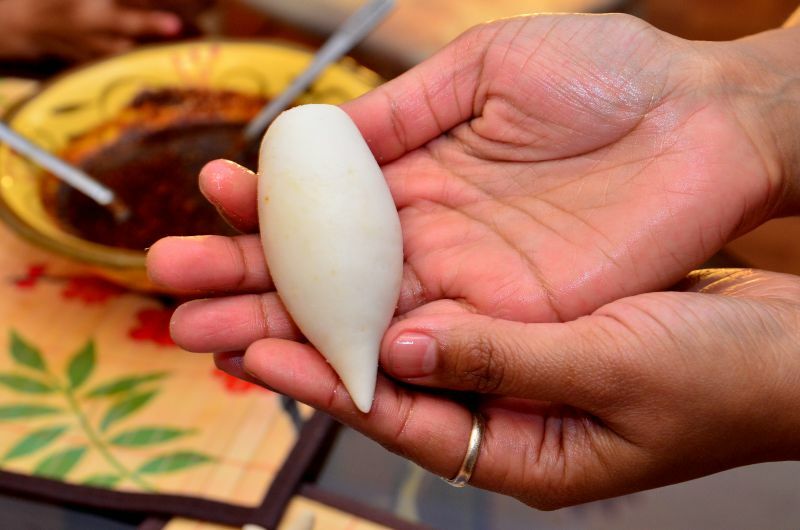 The dish has a peculiar shape made out of rice dough. Sweets like chaku and khuwa are packed inside the dough and steamed. Some of the variety also contains finely spiced lentil inside the steamed rice dough cover. Samay Baji is the famous Newari dish served as a starter in family get-together and festivals. The dish consists of Chiura ( beaten rice) and is served with many side dishes like Choila (marinated meat), fried boiled egg, black soybeans, spicy potato pickle, finely cut ginger, spiced beans, green leafy vegetables, buff and Newari drink called “Aila”. This food reflects unique feeding habits of Newar people in Nepal. 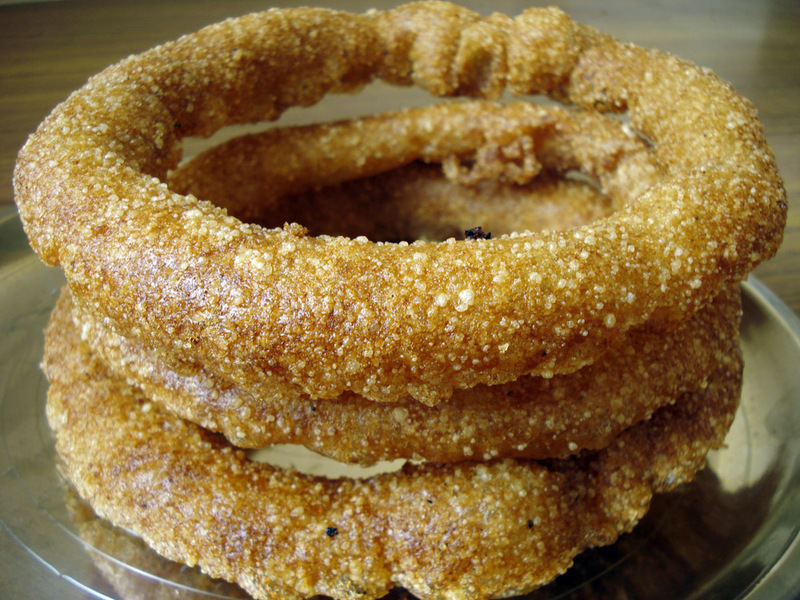 Sel Roti is a famous sweet, ring- shaped dish mostly prepared during Tihar. It is a deep fried rice dough. To add taste, sugar, and cardamom is mixed in the dough before frying it. Sel Rotis are common in local eateries and now available in some of the famous departmental stores in the cities. 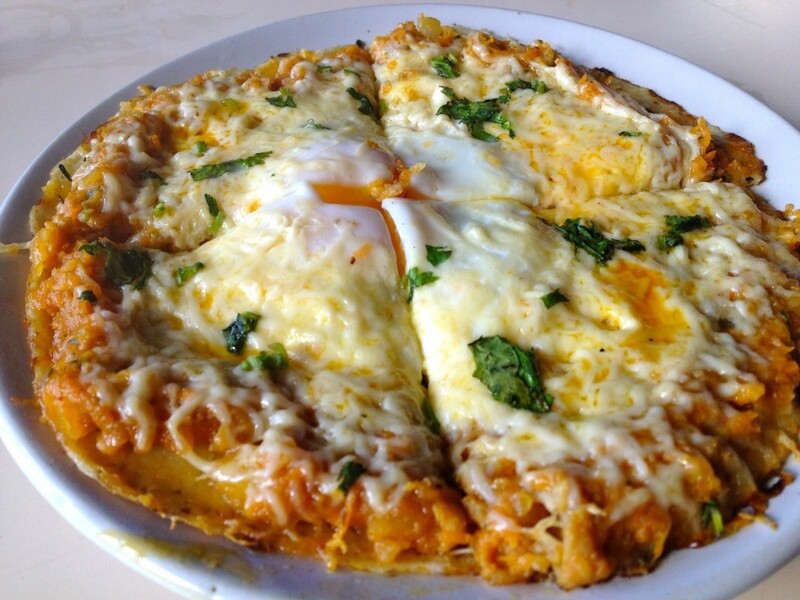 Chatamari, a must try delicacy of Nepal, is referred as Newari Pizza by many foreigners. It is made from rice flour. The rice crepe is topped with minced meat, egg and seasoned with vegetables. Prepared in a special way, it is quite different from other “Roti”- bread prepared in Nepal. The bread is baked without flipping it in the pan, unlike other bread. Dhido is a traditional Nepali food widely consumed in hilly and mountain region of Nepal, where rice and wheat is not abundant. Dhido is similar to Polenta and is made by continuously mixing hot water and flours of maize and buckwheat. It is often eaten along with local vegetable curry, pickle, or Gundruk (fermented leafy green vegetable) soup. Although a food of humble origin, Dhido is the second most popular dish in the country after Dal bhat and we can now find it being served in many Nepali restaurants. 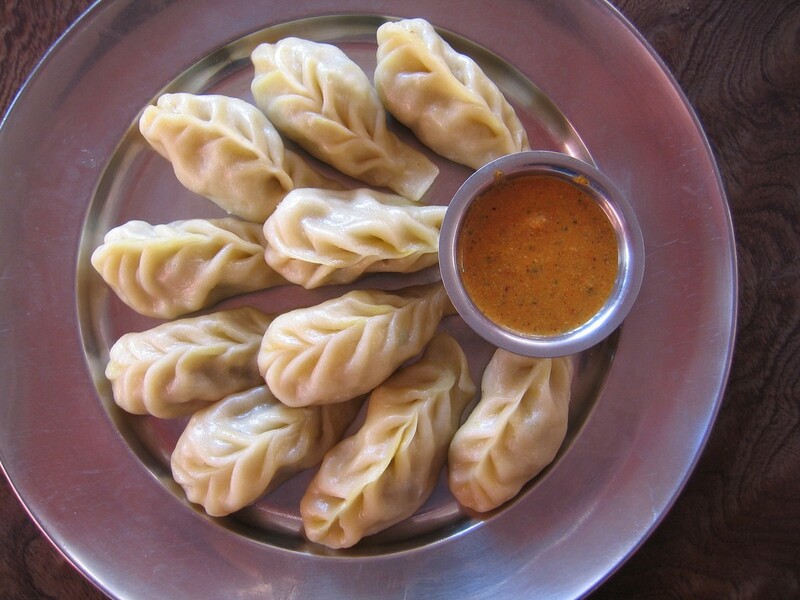 Momo or MoMo Cha (in Newar communities) is a famous food in Nepal. Momo are bite size dumplings filled with seasoned stuffing. Inside the dumpling you can add veggies, meat, sweets, or anything you prefer. Although the dish is said to be originated from Tibet, it highly evolved with Newari seasoning to suit the Nepali palate. Puwa is regarded as pious food among the Hindus. It is usually served during sacred rituals and Puja. This is a sweet dish prepared with rice flour, butter and sugar. 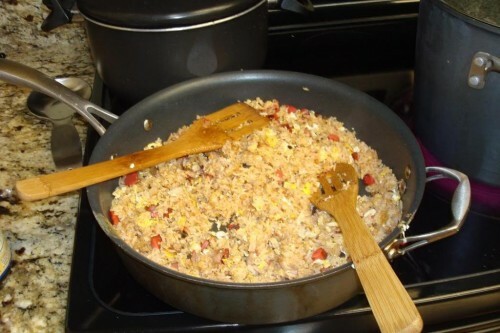 Sweet and crusty, it is a mouth watering dish prepared occasionally. You can eat it dry or with warm milk. Beside these, there are hundreds of local dishes available in Nepal. Trust me! They won’t disappoint you. Just give try to these Nepali treats. Pustakari: Pustakari is a sweet Nepali toffee made by stirring a big pan of mixed sugar,Khuwa (thickened milk), peanut powder and coconut with seasoning powder. Pau or Titaura: Pau literally means sour in Newari. This sour treats comes in variety and are made from local fruits like Lapsi (Hog plum), Amla (Phyllanthus emblica) and Tamarind, mango, lemon, and orange. Some of the varieties are sweet and salty while some are extremely spicy. Lakhamari: Lakhamari is a famous sweet from the Newer community. The sweet can be found in different shapes and sizes. Crispy , this is among the mouth-watering dish belonging to Newar community. Sukuti: Sukuti is a Nepali word for dry meat or Jerky. Sukuti is either consumed directly or spiced as a snack or mixed with other ingredients and served as side dish. 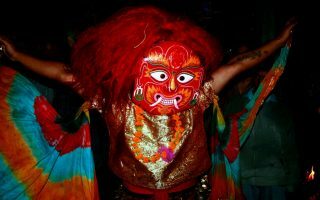 JuJu Dhau: Juju Dhau literally means King Curd. This thick and creamy curd from Bhaktapur is a must try while you are in Nepal. Yak Cheese: Yak-cheese is delicious cheese made from yak milk from the Himalayan region of Nepal. These days they are widely available in departmental stores in big cities of Nepal. Anarsa and Thekuwa: Thekuwa and Anarsa are the two famous sweets from Terai region of Nepal. These tasty sweets are prepared on the special occasions of Chhath ( Festival celebrated in Terai region of Nepal) . You may not find these foods in restaurants and hotels. But if you want to try them, make a special request to the restaurant or hotel you often visit or get a hold of a local friend. Any food in Nepal that you think should be included in this list? Please let us. You mention Pustakari and list some of the ingredients – can you supply me with a recipe for this treat? I have an idea of what goes into it but no idea as to the amounts or how long to cook, etc. Please help if you can! Sorry, we do not know the recipe for Pustakari. But you can easily buy these sweet treats in kathmandu’s local shops.